On August 21st and 22nd, a follow-up to the social dialogue held in Anosy in 2016 was held in Antananarivo and Fort-Dauphin. Several interviews sessions was held between MPs and CSOs to evaluate the impact of the social dialogue on the CSOs and to see how it has improved the dialogue between the MPs and the CSOs. CSOs noted that they face challenges in reaching their objectives due to the lack of resources, capacity and acceptance by the community as they perceive that MPs are undermining their efforts. The social dialogue exchange also identified the need for CSOs and elected representatives to remain in constant communication and to support CSOs by empowering them to ensure the sustainability of the dialogue. A further recommendation was that the social dialogue sessions should take place before each parliamentary session so that MPs are aware of local concerns and needs. On 4th and 5th July, a two day social dialogue was convened between MPs and CSOs from the Atsimo Andrefana region in Tulear, following requests from CSOs who had attended previous social dialogue sessions. This fifth social dialogue session adopted a new dialogue format whereby local government representatives such as the head of the Atsimo Andrefana region, were included. The first day of the workshop focused on the presentation of the role and function of both MPs and CSOs along with a session on MPs accountability. The second day was mainly an opportunity for exchange and dialogue. The topic of the DINA was the centre of the discussion as insecurity (in regard to livestock theft) is the main concern of all the constituencies within the region. At the end of the workshop, a joint plan of action was signed between CSOs and MPs to ensure the continuity of the dialogue. 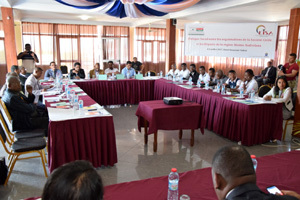 A social dialogue between MPs and Civil Society Organisations, facilitated by EISA was held in Tolagnaro, a city on the southeast coast of Madagascar, on 20 June 20 2016. The aim of the workshop was to create space for dialogue between MPs and local CSOs to create opportunities for strengthening citizen participation and engagement with MPs thereby promoting accountability of elected representatives to encourage good governance. The first part of the event consisted of knowledge updating on the representative role of MPs and the relationship between MPs and CSOs in the democratic process and in MPs parliamentary work. Discussions on topics related to local issues selected by CSOs were held in the afternoon under the topic good governance". 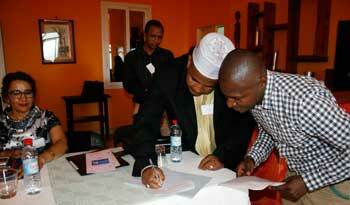 At the end of the workshop, a partnership agreement between CSOs and MPs was signed to continue with the dialogue. This social dialogue was initiated by EISA and the first such dialogue was held in Toamsina between MPs and CSOs in Toamasina in December 2015. An innovation of June 20 workshop was the signature of the partnership agreement. Malagasy CSOs were equipped with the skills necessary to inform and educate the electorate using voter sensitisation materials developed by EISA in partnership with the CENI-T. Besides training, documents produced in support of CSOs provided voters with information in French and Malagasy on how, where and when to register, as well as how to check the voter lists and ensure they have been duly included. All voter information and education materials produced by EISA for the CSOs were vetted by the CENI-T to ensure accuracy and consistency. EISA, within the framework of a joint project with the European Center for Electoral Support (ECES) and Electoral Reform International Services (ERIS), provided technical assistance to two CSO platforms, namely Mahitsy Fijery (or Direct Observation) and Socle (Citizen's monitoring and observation for the transparency of the elections) in planning, coordination and deployment of non-partisan citizen observers during the October and December elections. Through this support the two platforms deployed 1600 observers and 2500 observers respectively. Both platforms issued statements and declarations through which they provided their assessment of the conduct of the electoral process. This assistance was given in line with EISA's strategy to enhance the capacities of CSOs to observe the electoral process throughout the entire electoral cycle starting with selected observable pre-electoral activities such as voter registration. Leading up to the forth coming elections and in support of contributing to a peaceful election, EISA conducted a workshop to build the capacity of local citizen observation stakeholders and provided them with exposure to international best practices and principles of international electoral observation. 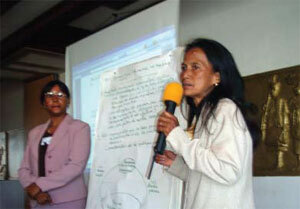 Training was conducted in Antananarivo from 19 to 21 September 2012 with 72 participants, including 45 women and 27 men. The workshop excited a great deal of interest and was attended by high level participants drawn from the CENIT, representatives of the Ministry of Home affairs, the President's Office, Members of Parliament, members of the VMLF (the women's network that EISA assisted in establishing) both at the national and regional level office, members of civil society, members of political parties and journalists. Further to this, EISA responded to a request from CSOs involved in citizen observation for support in citizen observation mission planning and coordination. A workshop was held on 23 November 2012 on issues pertaining to electoral codes of conduct for non-partisan observers. 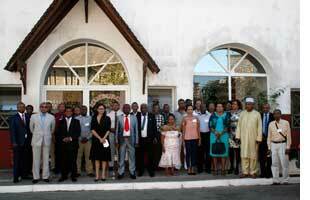 15 CSOs involved in citizen observation activities sent 28 representatives to this workshop, including 13 women. Through the workshop participants were familiarised with the role codes of conduct play in safeguarding the integrity, the non-partisanship character and credibility of election observation. CSOs at the workshop agreed upon and adopted a common code of conduct for all CSOs willing to share the same methodology in observing the upcoming general elections in Madagascar. The workshops also enabled CSOs to develop a common deployment plan for a nationwide citizen observer mission, which will include observers drawn from a wide range of CSOs and be able to observe all phases of the electoral process. Working closely with three local civil society organisations, namely Acces Zon'olombelona, Andrimaso FFKM and Komity Mpanaramaso ny Fifidianana Comité National d'Observation des Elections (KMF/CNOE), EISA and our partners developed a civic and voter education manual. Using the cascade approach EISA and our partners trained 44 participants in a train the trainer course on how to use the manual as well as facilitation skills. These facilitators conducted workshops in six regions, including Bongolava, Melaky, Analanjorofo, Farafangana and Diana. Participants were extremely responsive and highlighted that they had not previously been exposed to the material contained in this course. An added benefit was the experience and exposure that the 44 facilitators gained by conducting workshops and the opportunity to practice their skills. On 5 November 2008 a parliamentarian's workshop was held in Antananarivo, as well as a dialogue between parliamentarians and civil society organisations on 6 November. The workshop focused on the core functions of a parliamentarian i.e. oversight, legislation and representation. The policy dialogue brought together the 30 parliamentarians attending the workshop and representatives of national CSOs with a view to putting in place mechanisms for improved Parliament civil society engagement.